The Federal Executive Council (FEC) has approved the 2019 budget proposal. The approval was granted at Friday’s special session presided over by President Muhammadu Buhari. Briefing State House correspondents at the end of FEC meeting, the Minister of Budget and Planning, Udoma Udoma, said that the council would liaise with the National Assembly to determine when the president would submit the draft estimates for the consideration of the two legislative chambers. He, however, did not give details of the proposal, noting that the Nigerian Constitution only allows the president to give out the details and he would do so when the National Assembly was ready to receive the draft. The FEC had on October 24, approved the Medium Term Expenditure Framework (MTEF) and Fiscal Strategy Paper (FSP) for the 2019 -2021 to provide a template for the 2019 budget. 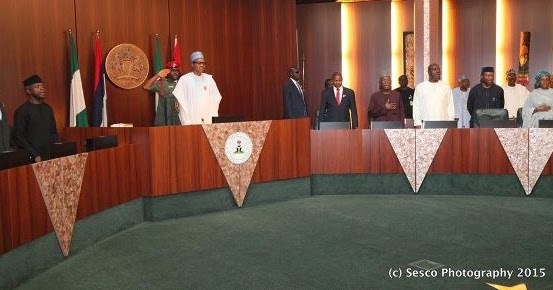 The session which was presided over by President Buhari approved a budget estimate of N8.73tr for the 2019 budget, N400bn less than last that of this year. It would be recalled that Udoma had last month announced that the Federal government was considering a leaner 2019 budget of N8.6 trillion, a figure less than the N9.1 trillion approved by the lawmakers for the 2018 budget. Udoma also revealed that government planned to cut down the level of borrowing from N1.6 trillion in 2018 to N1.5 trillion in 2019, while the deficit component would be reduced from N1.9 trillion in 2018 to N1.6 trillion. In spite of the recent oil output drop to about 1.9 million barrels a day, Udoma said government was optimistic that the 2.3 million barrels a day target was achievable with production now rising to about 2.15 million barrels a day and new oil production effort being put in place. Although a $50 per barrel oil price benchmark was proposed in the ERGP, the minister had expressed confidence that with a significant rise in the price above $80 per barrel, government had proposed a $60 per barrel oil price for the budget. Udoma added that N305 was proposed as exchange rate to the dollar, with government working to keep inflation down after slight increases in the last two months on the heels of 18 months consecutive decline. The projected Gross Domestic Product (GDP) growth rate for the budget was put at 3.01 per cent, reduced from 4.5 per cent in the ERGP, 3.6 per cent in 2020 and 3.9 per cent in 2021. “Growth is expected to increase from 0.8 per cent in 2017 to 2.1 per cent this year and 3.01 per cent in 2019 with the continued implementation of the ERGP in 2019 and an improved outlook for oil prices,” he said. Udoma noted that based on the oil price and oil production assumptions, government expected to generate about N3.6 trillion from oil, up by about N500 billion from last year’s figure. He said that about N6.9 trillion revenue was projected would be available to the budget in 2019. He said that with other projections, government expects to collect less revenue from some independent sources, adding that only about N624 billion was expected to be realised, contrary to N847 billion in the 2018 budget.